We specialize in cleanup and restoration! Whether it is an emergency response to a train derailment or a cleanup of an impacted legacy site, we can bring innovative thinking and customized equipment to address any environmental concern. 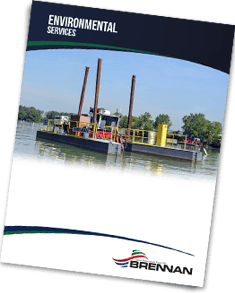 We specialize in providing environmental remediation services around open water, as well as sensitive wetlands. Our ability to respond quickly and provide both above and below water services allows us to be a go-to resource for several railroads. Brennan is one of the largest hazardous waste cleanup contractors in the United States. Every year we remove over 1 million cubic yards of contaminated sediment from industrial sites. Our HAZWOPER certified, knowledgeable crews will effectively manage the accompanying risks of both unintended environmental incidents as well as any legacy projects. Detailed reports and thorough quality control is facilitated throughout an environmental cleanup project to ensure the contaminants of concern are contained, removed, and disposed of in accordance with federal, state and local regulations. Our fleet of specialized environmental equipment allows us to access areas that few others can access. We can provide several alternatives to traditional remedial procedures such as the avoidance of building temporary access roads. 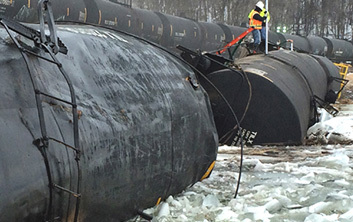 We also have several divers on staff that can assist with derailments on short notice if disaster strikes. For quick response, please contact our dispatch services! We are a resource to the railways. 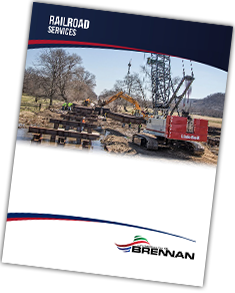 Count on Brennan to provide environmental services, bridge construction and repair services, culvert installation, underwater surveys and more. For more information please download our Railroad Construction Brochure. At Brennan, environmental work is one our key focuses, specifically on the inland waters and sensitive wetlands throughout the United States. We can provide railroads with several options and cost effective solutions to both derailments and legacy projects. Want more information on our environmental services? Fill out the form below!